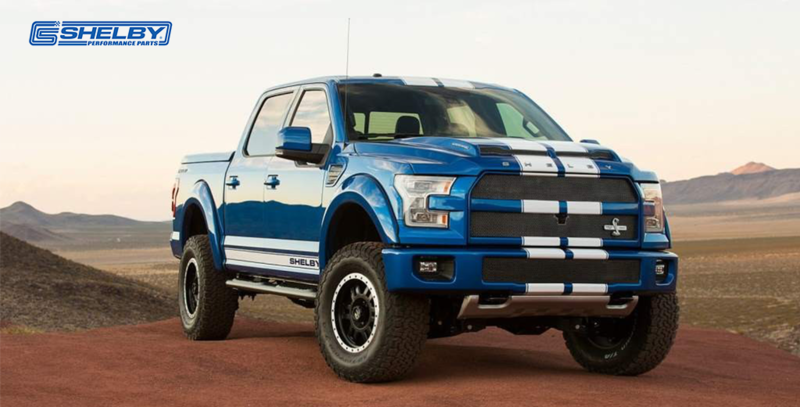 SHELBY AMERICAN IS PLEASED TO OFFER THE NEXT FORD WORTHY OF THE SHELBY BADGE: THE SHELBY F-150. For Ford truck enthusiasts, it is based on the best-selling F-150 with a powerful, naturally aspirated 395HP, 5.0L V8 engine that can be supercharged to over 700hp. Plus, we added more than 45 Shelby proprietary high-performance upgrades. Starting with the unmistakable Shelby striping and badging, unique polycarbonate hood, and ram air intake system to our BDS suspension with Fox shocks and Shelby-tuned BORLA performance dual-exhaust, this truck looks, sounds, and performs like no other F-150. But, there will only be 500 Shelby F-150s made each model year. See your authorized Shelby dealer to pick up (pun intended), your Shelby F-150 today. *The exclusive Shelby Engineered FOX Shock System includes Raptor Style FOX Shocks (all 4 wheels), front and rear 2.5" aluminum reservior shocks, top-of-the-line internal bypass technology, and adjustable dual-speed controls. This proprietary system provides the ability to tune your Shelby truck from luxury car smooth to hard-core off-road or track handling.